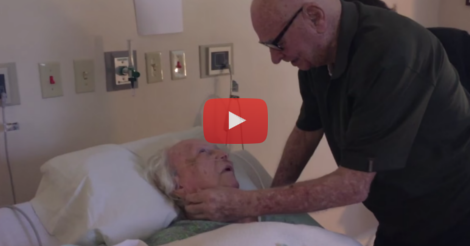 After 73 Years Of Marriage, This 92 Year Old Man Serenades His 93 Year Old Wife In Her Last Moments. You’ll Need Tissues, Trust Me! This is what I thought about when I was a little girl and my sisters would plan their “weddings.” We would cut out pictures from magazines and keep them in a treasure chest in the attic, imagining what their dresses will look like when the big day come around. But I would think about the times after the wedding, and they would tease me for it. “It’s just one day” I would say to them, but I guess I shouldn’t have expected a 5 and 7 year old to know as much as a 9 year old. I wanted a happy life, and I wanted to travel, and I wanted to have a family. I didn’t get the traveling part, but I have a happy life and a family, so that’s 2 out of 3! Watching this couple brings me so much joy! This is what I want my final days to look like, serenading my true love at the very end, surrounded by the ones we love the most! The good news is that only a few days after this video was taken, the doctors decided that she was strong enough to rest comfortably at home until the end. She is still alive several weeks later, and they are still enjoying each other’s company for as much time as they have left!